We know that account subscriptions are on the way down, but still not to the point of risking world of warcraft as a huge game, or as a positive money generator. We know that several new offers have been made to entice new players (quasi-F2P and recruit a friend to 80) into the game, or get people to return. There are far more players than readers of blogs, and far more readers than people actually blogging. I don’t know the number, but at least 1000:100:1 would be a minimum (a total guess). When I went through the massive list of rss subscriptions I have for WoW blogs, I had to remove over 30 blogs, as they had officially retired or not posted in 2011 at all. Some of those blogs were the cornerstone of small community of readers, with specialised focus, who contributed daily content, instead of the weekly and monthly blogs that are around. There is no way that my blog list was exhaustive, in fact it pertained to New, Announcements, Death Knights, and the few other classes I play. Sometimes added were the huge profile bloggers like BBB, who create content that is basically best of breed. Not posting for 6 months is a reasonable indicator that the person has a much lower interest in the game. It was depressing, and while I’m a little sad by the passing of so many good contributors (stealing ideas was great) I hope it is ok. I think this withdrawl is only making the remaining blogs stronger and it opens opportunities for new bloggers too. It certainly helps the aggregator services garner good content, and it also has a flow on affect of making it easier to find those folks who have been at it for a while. When I stated raving on this small digital soapbox there were a small number of people really doing solid work. Starting was intimidating. Then the community exploded and we saw 20 new blog sites each week. Now we’re back to smaller numbers but a more specialised group. I still see a ton of Hunter blogs, Warrior blogs, and general toon & personality blogs. There are also heaps of gold generation blogs, if you like that kind of thing. And guys like Tobold will be writing about games until they turn off the sun – so all is not lost for us as an audience and community. I don’t see a huge number of Death Knight blogs, and I miss the contribution from folks like Skeleton Jack and the DeathKnight.info community. The stable EJ forums still pelt out the theory-craft too, but only if you want that core knowledge – banter on lore and stories are not received well there. Perhaps the up-swell of Twitter has moved some of the general DK banter to there too, which replaces the need for casual bloggers? I didn’t see anything cohesive there though. There is no real message on this post; just a wish that more folks would blog, comment, and cross-link. I feel that the retirement of blog writers reflects a slow down in the tempo of the community, which is sad. There are so many more things to be gained by sharing than just listening and nodding. So in closing if you’ve thought about it, or stopped – consider a return to chatter. Happy blogging, reading, and as always, killing. TyphoonAndrew. Scammers are stupid, but getting smarter. Another of those emails to open our wow accounts received today, but this one was a direct copy of the Blizzard real email. I’m not re-posting the screen as its a pretty standard set of text with little value. Account fishing scams are poor form, but par for the course now. Using an exact duplicate of the Blizzard change of account preferences is a much better approach for the hackers, as Gmail won’t filter it automatically and it raises the question in your mind if somebody else has opened your account. It could also be seen as legit if you did just change something on your account. So kudos you filthy hackers for evolving from pond scum. The old advice still stands: Never click a link in an email. 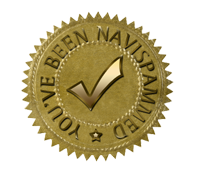 Seeing the email quality rise is to be legible instead of the janglish junk that normally is spammed is perhaps a sign that spam filters are actually helping us. I know that I couldn’t live without one. I’m more worried now about somebody getting my gmail password than my wow account. 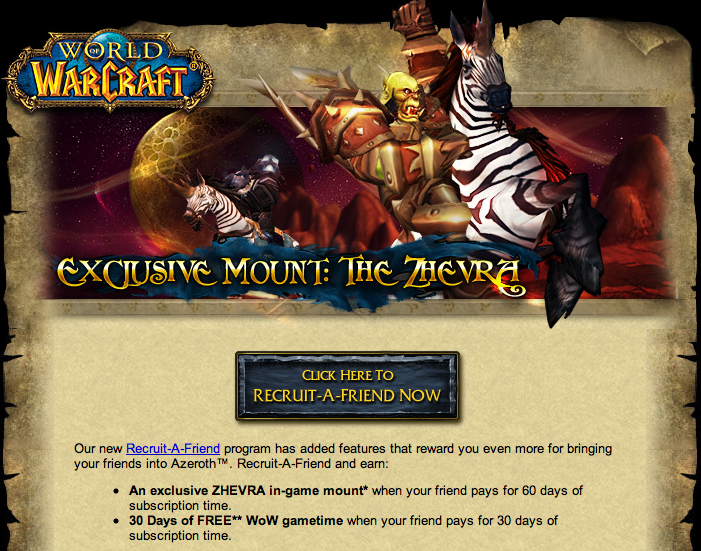 Blizzard announced some great offers for recruiting a friend to play world of warcraft. Good, this keep the player base evolving, and I think its an OK thing to offer. The official FAQ page is pretty handy, and worth a read, then the whinging, and the place where its supposed to be discussed which has reached 35 pages. You and your friend will earn triple the experience when grouped together! For every two levels of experience your friend earns, they can grant one level of experience to any one of your characters of lower level than your friend. You and your friend will have the ability to summon each other from any point in the world, once per hour. Edit: Blizzard has also sent a promo about the Recruit Offer. So even if players are not already thinking of doing it, now you have a direct incentive. I’m looking at my email list wondering who I can encourage into the game now, which is exactly the response this is designed to invoke. Yes, a new multi-boxer will get a boost from this, but really its all about player recruitment. More players make for more opportunities. There is already plenty of diversity in the player base, and now we will hopefully have a few fresh recruits too (insert joke about fresh meat / noob for the WoW machine here…). The mount is cool, and a collector’s item. Just like all the neat stuff offered by the cards and such; this is in no way game breaking. Nope, but please stop whinging about changes like this not being back-tracked. I know it would be nice, but that is the nature of the beast. Blizzard also could not bandage your bruised ego from when the mounts went to Level 30. This should be looked at as an improvement for the future of the game, not a slight against the folks who already play. You have to play together. The bonus only applies if you are grouped, same level, and working as a team. Newbie can give levels away, which is wonderful. This means the more experienced player can have a quick step too, making both toons get through the “old world” content faster. Fantastic, the less time in STV the better. I’ve also read a lot of posts along the line of “this is ruining the game because…“. IMHO the folks who whinge and think it always has to be the same as when they played through are doing more to keep the game from improving that offers like this.